Bleach Wallpaper: CTI: Who are they to you? 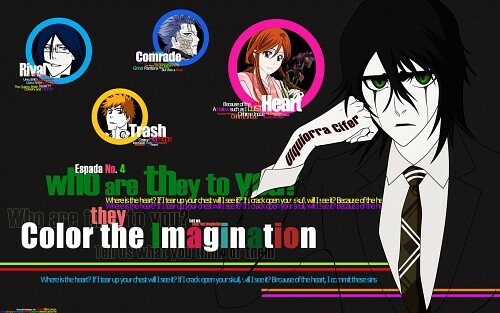 Minitokyo »	Bleach Wallpapers » Bleach Wallpaper: CTI: Who are they to you? This is the first version of Color the Imagination, featuring the dashing Number Cuatro, Ulquiorra Cifer from Bleach. The Question asked here is: Who are they to you? Let's take it like an interview. If I were to ask Ulquiorra this question, he'll probably give answers in a nonchalant way. I featured four other characters with him and asked him about his thoughts on them. Of course, these answers are something I came up that I think he would say. For Ishida, I think Rival would get his choice of word. I'm an IshiHime Shipper as well, and I personally think the Quincy has a thing for Orihime, which is so cute. And since Ulquiorra lusts everything about Orihime, it would make one heck of a dangerous love triangle. Here we have Ichigo. When Ulquiorra first saw the orange-haired Shinigami and analyzed his powers, he deemed him as trash and not worth the kill. Ichigo is also Orihime's hope, so he wishes to destroy that in order to bring her despair. I initially thought of putting Aizen there, but I like Grimmjow more. Grimmjow, as we all know, is one of the Espada. Therefore, he and Ulquiorra are technically allies, and at the same time they're sort of rivals. Grimmjow seems to look at it that way. Last but not the least, we have Orihime-chan. In his last moments of life, Ulquiorra was entrusted with the heart. He was fascinated with her strength, her heart, and the emotions she expressed. Everything about her seems to draw him in. That's why she's the heart for Ulquiorra. I was supposed to submit this during Ulquiorra's birthday, but work got the best of my time, so yeah...I know it's late. All right, now about this wallpaper. As you can see it highlights simplicity. I wanted to give meaning to the neutral colors of black and grey, and still get the essence of being colorful. Play around with the texts and colors can give you various results. I spent some time trying to fit the texts and colors in the right places, changing their sizes and all. Note that all of them are my favorite characters in Bleach. Ishida and Ulquiorra as rivals? I'd say they're more suited to be rivals for Orihime than Ichigo. And Ichigo is trash? You're pretty right on the mark there. I can totally imagine Ulquiorra saying these things when you ask him "Who are they to you?" First of all, I'm not that much fond of Ulquiorra before, but now I see he's pretty drool-worthy! Man, bishies like him deserve attention and it's great that he's the main focus of the wallpaper. The simplicity is just beautiful here. Neutral colors mixed with colorful ones<<definitely great combination. And the typography is nice. You mixed and match everything well. Good of you to add Grimmjow too. I kinda like his character. And it's true that he's a comrade and a rival for Ulquiorra. oooh great design and wallie, thanks for the submission/sharing! I love it, it's great... thanks for sharing! I love Ulquiorra, it's great... thanks for sharing! Nice vector and color composition! Thx!